Former WBC light heavyweight champion Adonis Stevenson was knocked out in the eleventh round by the newly crowned champion, thereby ending Stevenson’s five-year reign as a champion. 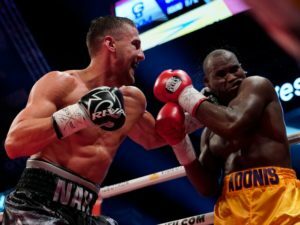 Canada native Stevenson was knocked out by Oleksandr Gvosdyk of Ukraine in a light heavyweight title bout that took place in Quebec City, Montreal. Gvosdyk knocked out Stevenson with a flurry of hard shots at 2:49 seconds of the 11th round. The 41-year-old boxer was put on a stretcher after the bout and left Videotron Centre in an ambulance. However, according to his promoter Yvon Michel, Stevenson’s condition has not improved and he is still in a coma and doctors sedated him and placed him on a ventilator since December 1. Promoter Yvon Michel said Thursday “doctors do not venture an opinion on what lies ahead” for the former WBC light heavyweight champion. SportsIndiashow and MMAIndia team pray for the speedy recovery of the former Light Heavyweight champion.